Banana is the common name for any of the very large, tree-like, herbaceous plants comprising the genus Musa of the flowering plant family Musaceae, characterized by an above-ground pseudostem (false stem) with a terminal crown of large leaves, and hanging clusters of edible, elongated fruit. The term also is used for the fruit, which typically has a yellowish or reddish skin when ripe, and is very important commercially. Bananas provide various culinary, commercial, and ecological values. Bananas are cultivated primarily for their fruit, and to a lesser extent for the production of fiber and as ornamental plants. The fruit can be eaten raw, dried, or cooked. Its unique taste and texture, and the fact that it can be obtained year round, makes it very popular. Ecologically, the plants provide food for various animals, including insects. Bananas are native to the tropical region of Southeast Asia, the Malay Archipelago, and Australia. Today, they are cultivated throughout the tropics. 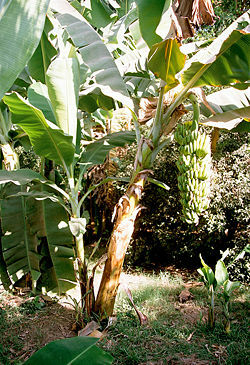 Bananas are among the largest herbaceous plants. As banana plants stand tall, upright, and fairly sturdy, they are often mistaken for woody trees. However, the main or upright, above-ground "stem" is actually a pseudostem, literally meaning "fake stem"; the actual stem is underground. There are suckers that grown around the main plant, and after the plant fruits and dies, the oldest sucker will replace the pseudostem, with this process continuing indefinitely (Morton 1987). From 4 to 15 oblong or elliptic leaves with fleshy stalks are spirally arranged and unfurl as the plant grows, becoming as much as 2.75 meters (nine feet) long and 60 centimeters (two feet) wide (Morton 1987). Each pseudostem produce a bunch of yellow, green, or even reddish bananas before dying and being replaced by another pseudostem. The banana fruit grow in hanging clusters, with up to 20 fruit to a tier (called a hand), and 3-20 tiers to a bunch. The total of the hanging clusters is known as a bunch, or commercially as a "banana stem," and can weigh from 30–50 kilograms. Each individual fruit (known as a banana or "finger") has a protective outer layer (a peel or skin) with a fleshy edible inner portion. Typically, the fruit has numerous strings (called "phloem bundles") that run between the skin and the edible portion of the banana, and which are commonly removed individually after the skin is removed. The fruit of the common banana averages 125 grams, of which approximately 75 percent is water and 25 percent dry matter content. Bananas come in a variety of sizes and colors when ripe, including yellow, purple, and red. Although the wild species have fruits with numerous large, hard seeds, virtually all culinary bananas have seedless fruits. In popular culture and commerce, "banana" usually refers to soft, sweet "dessert" bananas that are usually eaten raw. Bananas may also be dried and eaten as a snack food. Dried bananas are also ground into banana flour. Cooking bananas are very similar to potatoes in how they are used. Both can be fried, boiled, baked, or chipped and have similar taste and texture when served. Depending upon cultivar and ripeness, the flesh can vary in taste from starchy to sweet, and texture from firm to mushy. Unripe or green bananas and plantains are used for cooking various dishes and are the staple starch of many tropical populations. 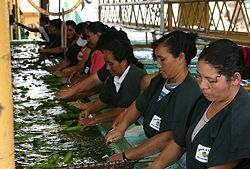 Most production for local sale is of green cooking bananas and plantains, as ripe dessert bananas are easily damaged while being transported to market. Even when only transported within their country of origin, ripe bananas suffer a high rate of damage and loss. Bananas are a valuable source of vitamin B6, vitamin C, and potassium. There are various species, hybrids, and cultivars of bananas. The most common bananas for eating (dessert bananas) in temperate countries belong to the species M. acuminata, or to the hybrid Musa x paradisiaca or M. sapientum (M. acumianta X M. balbisiana) (Morton 1987). They are popular in part because being a non-seasonal crop they are available fresh year-round. In global commerce, by far the most important of these banana cultivars is "Cavendish," which accounts for the vast bulk of bananas exported from the tropics. The Cavendish gained popularity in the 1950s after the previously mass produced cultivar, Gros Michel, became commercially unviable due to Panama disease, a fungus which attacks the roots of the banana plant. The most important properties making Cavendish the main export banana are related to transport and shelf life rather than taste; major commercial cultivars rarely have a superior flavor compared to the less widespread cultivars. Export bananas are picked green, and then usually ripened in ripening rooms when they arrive in their country of destination. These are special rooms made air-tight and filled with ethylene gas to induce ripening. Bananas can be ordered by the retailer "ungassed," however, and may show up at the supermarket still fully green. While these bananas will ripen more slowly, the flavor will be notably richer, and the banana peel can be allowed to reach a yellow/brown speckled phase, and yet retain a firm flesh inside. Thus, shelf life is somewhat extended. The flavor and texture of bananas are affected by the temperature at which they ripen. Bananas are refrigerated to between 13.5 and 15 °C (57 and 59 °F) during transportation. At lower temperatures, the ripening of bananas permanently stalls, and the bananas will eventually turn grey. The term plantain is used for some types of the Musa genus. However, the term is variously applied. The bananas from a group of cultivars with firmer, starchier fruit may called plantains, and are generally used in cooking rather than eaten raw. For American consumers, generally the term banana is used for the yellow fruits marketed for raw consumption while plantain is used for the larger, more angular fruits intended for cooking but also edible raw when fully ripe (Morton 1987). . It should be noted that Musa × paradisiaca is also the generic name for the common plantain, a coarser and starchier variant not to be confused with Musa acuminata or the Cavendish variety. Plantains have all but replaced the Cavendish in markets dominated by supply-side logistics. M. acuminata x balbisiana inflorescence, partially opened. In addition to the fruit, the flower of the banana plant (also known as banana blossom or banana heart) is used in Southeast Asian, Bengali and Kerala (India) cuisine, either served raw with dips or cooked in soups and curries. The tender core of the banana plant's trunk is also used, notably in the Burmese dish mohinga, Bengali and Kerala cooking. Bananas fried with batter is a popular dessert in Malaysia, Singapore, and Indonesia. Banana fritters can be served with ice-cream as well. Bananas are also eaten deep fried, baked in their skin in a split bamboo, or steamed in glutinous rice wrapped in a banana leaf in Myanmar, where bunches of green bananas surrounding a green coconut in a tray is an important part of traditional offerings to the Buddha and the Nats. Banana chips are a snack produced from dehydrated or fried banana or, preferably, plantain slices, which have a dark brown color and an intense banana taste. Bananas have also been used in the making of jam. Unlike other fruits, it is difficult to extract juice from bananas because when compressed a banana simply turns to pulp. Seeded bananas (Musa balbisiana), considered to be one of the forerunners of the common domesticated banana, are sold in markets in Indonesia. There are two established forms of allergy to bananas. One is oral allergy syndrome, which causes itching and swelling in the mouth or throat within one hour after ingestion and is related to birch tree and other pollen allergies. The other is related to latex allergies and causes urticaria and potentially serious upper gastrointestinal symptoms (Informall 2007). Banana plant, Luxor, Egypt - Bananas are continually cropped, fruits from higher in the inflorescence being taken before the lower part opens. The banana plant has long been a source of fiber for high quality textiles. In Japan, the cultivation of banana for clothing and household use dates back to at least the thirteenth century. In the Japanese system, leaves and shoots are cut from the plant periodically to ensure softness. The harvested shoots must first be boiled in lye to prepare the fibers for the making of the yarn. These banana shoots produce fibers of varying degrees of softness, yielding yarns and textiles with differing qualities for specific uses. For example, the outermost fibers of the shoots are the coarsest, and are suitable for tablecloths, whereas the softest innermost fibers are desirable for kimono and kamishimo. This traditional Japanese banana cloth making process requires many steps, all performed by hand (KBFCA). In another system employed in Nepal, the trunk of the banana plant is harvested instead, small pieces of which are subjected to a softening process, mechanical extraction of the fibers, bleaching, and drying. After that, the fibers are sent to the Kathmandu valley for the making of high-end rugs with a textural quality similar to silk. These banana fiber rugs are woven by the traditional Nepalese hand-knotted methods. Banana fiber is also used in the production of banana paper. Banana paper is used in two different senses. In one sense, it refers to a paper made from the bark of the banana plant, mainly used for artistic purposes. Secondly, it may refer to paper made from banana fiber, obtained from an industrialized process, from the stem and the non-utilizable fruits. This paper can be either hand-made or made by industrialized machine. Banana sap is extremely sticky and can be used as a practical adhesive. Sap can be obtained from either the pseudostem, the fruit peelings, or from the flesh. The leaves of the banana are large, flexible, and waterproof; they are used in many ways, including as umbrellas and to wrap food for cooking, including carrying and packing cooked foods. In south India, food is traditionally served on banana leaves in homes and some restaurants also follow the practice. Chinese zongzi (bamboo leaves are more commonly used where available) and Central American tamales are sometimes steamed in banana leaves, and the Hawaiian imu is often lined with them. Puerto Rican "pasteles" are boiled, wrapped and tied inside the leaf. Some farmers prefer to grow banana plants only for their leaves. The juice extract prepared from the tender core is used to treat kidney stones. It is reported that in Orissa, India, juice is extracted from the corm and used as a home remedy for the treatment of jaundice. In other places honey is mixed with mashed banana fruit and used for the same purpose. The domestication of bananas took place in southeastern Asia. Many species of wild bananas still occur in New Guinea, Malaysia, Indonesia, and the Philippines. Recent archaeological and palaeoenvironmental evidence at Kuk Swamp in the Western Highlands Province of Papua New Guinea suggests that banana cultivation there goes back to at least 5000 B.C.E., and possibly to 8000 B.C.E. (APSF 2007). This would make the New Guinean highlands a potential place where bananas were first domesticated. It is likely that other species of wild bananas were later also domesticated elsewhere in southeastern Asia. Some recent discoveries of banana phytoliths in Cameroon, dating to the first millennium B.C.E. (de Langhe and de Maret), have triggered an as yet unresolved debate about the antiquity of banana cultivation in Africa. There is linguistic evidence that bananas were already known in Madagascar around that time (Zeller 2005). The earliest evidence of banana cultivation in Africa before these recent discoveries dates to no earlier than late sixth century C.E. (Lejju et al. 2006). These were possibly spread there by Arab merchants. The banana is mentioned in written history as far back as 600 B.C.E. in Buddhist texts, and Alexander the Great discovered the taste of the banana in the valleys of India in 327 B.C.E. Banana corms, used in the propagation of domesticated bananas. While the original bananas contained rather large seeds, triploid (and thus seedless) cultivars have been selected for human consumption. These are propagated asexually from offshoots of the plant. This involves removing and transplanting part of the underground stem (called a corm). Usually this is done by carefully removing a sucker (a vertical shoot that develops from the base of the banana pseudostem) with some roots intact. However, small sympodial corms, representing not yet elongated suckers, are easier to transplant and can be left out of the ground for up to two weeks; they require minimal care and can be boxed together for shipment. In some countries, bananas are commercially propagated by means of tissue culture. This method is preferred since it ensures disease-free planting material. When using vegetative parts such as suckers for propagation, there is a risk of transmitting diseases (especially the devastating Panama disease). While in no danger of outright extinction, the most common edible banana cultivar "Cavendish" (extremely popular in Europe and the Americas) could become unviable for large-scale cultivation in the next 10-20 years. Its predecessor, the cultivar "Gros Michel," which was discovered in the 1820s, has already suffered this fate. Like almost all bananas, it lacks genetic diversity, which makes it vulnerable to diseases, which threaten both commercial cultivation and the small-scale subsistence farming (NS 2006; Montpellier 2003). Even though it is no longer viable for large scale cultivation, Gros Michel is not extinct and is still grown in areas where Panama Disease is not found. Likewise, Cavendish is in no danger of extinction, but it may leave the shelves of the supermarkets for good if diseases make it impossible to supply the global market. It is unclear if any existing cultivar can replace Cavendish on a scale needed to fill current demand, so various hybridization and genetic engineering programs are working on creating a disease-resistant, mass-market banana. Australia is relatively free of plant diseases and therefore prohibits imports. When Cyclone Larry wiped out Australia's domestic banana crop in 2006, bananas became relatively expensive, due to low supply domestically, and laws prohibiting banana imports. Bananas are grown in at least 107 countries (FAO 2004). Bananas are classified either as dessert bananas (meaning they are yellow and fully ripe when eaten) or as green cooking bananas. Almost all export bananas are of the dessert types; however, only about 10-15 percent of all production is for export, with the United States and the European Union being the dominant buyers. Women in Belize sorting bananas and cutting them from bunches. Source: UN Food & Agriculture Organization (FAO 2005). Bananas and plantains constitute a major staple food crop for millions of people in developing countries. In most tropical countries green (unripe) bananas used for cooking represent the main cultivars. In 2003, India led the world in banana production, representing approximately 23 percent of the worldwide crop, most of which was for domestic consumption. The four leading banana exporting countries were Ecuador, Costa Rica, Philippines, and Colombia, which accounted for about two-thirds of the world's exports, each exporting more than one million tons. Ecuador alone provided more than 30 percent of global banana exports, according to FAO statistics. The vast majority of producers are small-scale farmers growing the crop either for home consumption or for local markets. Because bananas and plantains will produce fruit year-round, they provide an extremely valuable source of food during the hunger season (that period of time when all the food from the previous harvest has been consumed, and the next harvest is still some time away). It is for these reasons that bananas and plantains are of major importance to food security. Bananas are among the most widely consumed foods in the world. Most banana farmers receive a low unit price for their produce as supermarkets buy enormous quantities and receive a discount for that business. Competition among supermarkets has led to reduced margins in recent years, which in turn has led to lower prices for growers. Chiquita, Del Monte, Dole and Fyffes grow their own bananas in Ecuador, Colombia, Costa Rica, Guatemala and Honduras. Banana plantations are capital intensive and demand high expertise so the majority of independent growers are large and wealthy landowners of these countries. This has led to bananas being available as a "fair trade" item in some countries. The banana has an extensive trade history beginning with the founding of the United Fruit Company (now Chiquita) at the end of the nineteenth century. For much of the 20th century, bananas and coffee dominated the export economies of Central America. In the 1930s, bananas and coffee made up as much as 75 percent of the region's exports. As late as 1960, the two crops accounted for 67 percent of the exports from the region. Though the two were grown in similar regions, they tended not to be distributed together. The United Fruit Company based its business almost entirely on the banana trade, as the coffee trade proved too difficult for it to control. The term "banana republic" has been broadly applied to most countries in Central America, but from a strict economic perspective only Costa Rica, Honduras, and Panama were actual "banana republics," countries with economies dominated by the banana trade. The United States has minimal banana production. 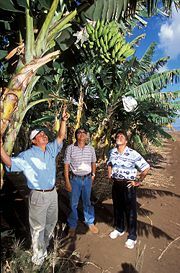 About 14,000 tons of bananas were grown in Hawaii in 2001 (Sugano et al. 2003). Most bananas grown worldwide are used for local consumption. In the tropics, bananas, especially cooking bananas, represent a major source of food, as well as a major source of income for smallholder farmers. It is in the East African highlands that bananas reach their greatest importance as a staple food crop. In countries such as Uganda, Burundi, and Rwanda, the per capita consumption has been estimated at 450 kilograms per year, the highest in the world. Ugandans use the same word "matooke" to describe both banana and food. In the past, the banana was a highly sustainable crop with a long plantation life and stable yields year round. However with the arrival of the Black Sigatoka fungus, banana production in eastern Africa has fallen by over 40 percent. For example, during the 1970s, Uganda produced 15 to 20 metric tons of bananas per hectare. Today, production has fallen to only six tons per hectare. The situation has started to improve as new disease resistant cultivars have been developed such as the FHIA-17 (known in Uganda as the Kabana 3). These new cultivars taste different from the traditionally grown banana, which has slowed their acceptance by local farmers. However, by adding mulch and animal manure to the soil around the base of the banana plant, these new cultivars have substantially increased yields in the areas where they have been tried. In the current world marketing system, bananas are grown in the tropics, and the fruit has to be transported over long distances. To gain maximum life, bunches are harvested before the fruit is fully mature. The fruit are carefully handled, transported quickly to the seaboard, cooled, and shipped under sophisticated refrigeration. The basis of this procedure is to prevent the bananas producing ethylene, which is the natural ripening agent of the fruit. This sophisticated technology allows storage and transport for 3-4 weeks at 13 degrees Celsius. On arrival at the destination, the bananas are held typically at about 17 degrees Celsius and treated with a low concentration of ethylene. After a few days, the fruit has begun to ripen and it is distributed for retail sale. It is important to note that unripe bananas can not be held in the home refrigerator as they suffer from the cold. After ripening, some bananas can be held for a few days in the home refrigerator. Some researchers have shown that the use of refrigeration is no longer essential to extend the life of bananas after harvest (Scott et al. 1970; Scott et al. 1971; Scot and Gandanegara 1974). These researchers report that the presence of carbon dioxide (which is produced by the fruit) extends the life and the addition of an ethylene absorbent further extends the life even at high temperatures. This simple technology involves packing the fruit in a polyethylene bag and including an ethylene absorbent, potassium permanganate, on an inert carrier. The bag is then sealed with a band or string. This low cost treatment more than doubles the life at a range of temperatures and can give a life of up to 3-4 weeks without the need of refrigeration. The method is suitable for bunches, hands, and even fingers. The technology has been successfully tested over long distances and has been confirmed by researchers in a number of countries. The longest commercial trial was from North Queensland to New Zealand by unrefrigerated rail and ship over 18 days. The technology, however, has not been widely adopted. Bananas are often sold in bundles, as shown above. Australia & Pacific Science Foundation (APSF). 2007. Tracing antiquity of banana cultivation in Papua New Guinea. Australia & Pacific Science Foundation. Retrieved December 15, 2007.
de Langhe, E., and P. de Maret. n.d. Tracking the banana: Significance to early agriculture. Coconutstudio.com. Retrieved December 15, 2007. (June 2003). Retrieved December 15, 2007. Food and Agriculture Organization of the United Nations (FAO). 2004. Bananas commodity notes: Final results of the 2003 season. FAO. Retrieved December 15, 2007. Food and Agriculture Organization of the United Nations (FAO). 2005. FAOSTAT. FAO. Retrieved December 15, 2007. Informall. 2007. Communicating about food allergies: General information for banana. The Informall Database. Retrieved December 15, 2007. Kijoka Banana Fiber Cloth Association (KBFCA). n.d. Traditional crafts of Japan: Kijoka banana fiber cloth. Association for the Promotion of Traditional Craft Industries. Retrieved December 15, 2007. Leibling, R. W., and D. Pepperdine. 2006. Natural remedies of Arabia. Saudi Aramco World 57(5): 14. Lejju, B. J., P. Robertshaw, and D. Taylor. 2006. Africa's earliest bananas?. Journal of Archaeological Science 33: 102-113. Retrieved December 15, 2007. Montpellier, E. F. 2003. Rescuing the banana. New Scientist (February 8, 2003). Retrieved December 15, 2007. Morton, J. 1987. Banana. In J. Morton and C. F. Dowling. 1987. Fruits of Warm Climates. Miami, FL: J.F. Morton. ISBN 0961018410. New Scientists (NS). 2006. A future with no bananas?. New Scientist May 13, 2006. Retrieved December 15, 2007. Scott, K. J., W. B. McGlasson, and E. A. Roberts. 1970. Potassium permanganate as an ethylene absorbent in polyethylene bags to delay the ripening of bananas during storage. Australian Journal of Experimental Agriculture and Animal Husbandry 110: 237-240. Scott, K. J., J. R. Blake, N. Stracha, B. L. Tugwell, and W. B. McGlasson. 1971. 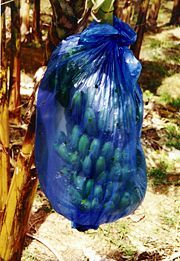 Transport of bananas at ambient temperatures using polyethylene bags. Tropical cha Agriculture (Trinidad) 48: 163-165. Scott, K. J., and S. Gandanegara. 1974. Effect of temperature on the storage life of bananas held in polyethylene bags with an ethylene absorbent. Tropical Agriculture (Trinidad) 51: 23-26. Skidmore, T., and P. Smith. 2001. Modern Latin America, 5th edition. New York: Oxford University Press. ISBN 0195129954. Sugano, B. S., R. F. L. Mau, et al. 2003. Crop profile for bananas in Hawaii. USDA Regional IPM Centers Information System. Retrieved December 15, 2007. Zeller, F. J. 2005. Origin, diversity and breeding of banana and plantain (Musa spp.). Journal of Agriculture and Rural Development in the Tropics and Subtropics Supplement 81. Retrieved December 15, 2007. This page was last modified on 5 November 2008, at 03:46.